to help advertisers reach customers in a multi-screen world. Today we’re pleased to announce that Product Listing Ads are now eligible to appear on smartphones globally, extending the shopping experience already available on desktops and tablets. When a user enters a shopping-related search, a commercial format that displays products in a single unit may appear above organic search results. This ad unit is labeled as ‘Sponsored’ and displays rich product images, prices, retailers and more. This mobile shopping experience will be available in all markets currently serving Product Listing Ads. Below are a couple of examples of what a shopper might see when searching for a product from their phone. 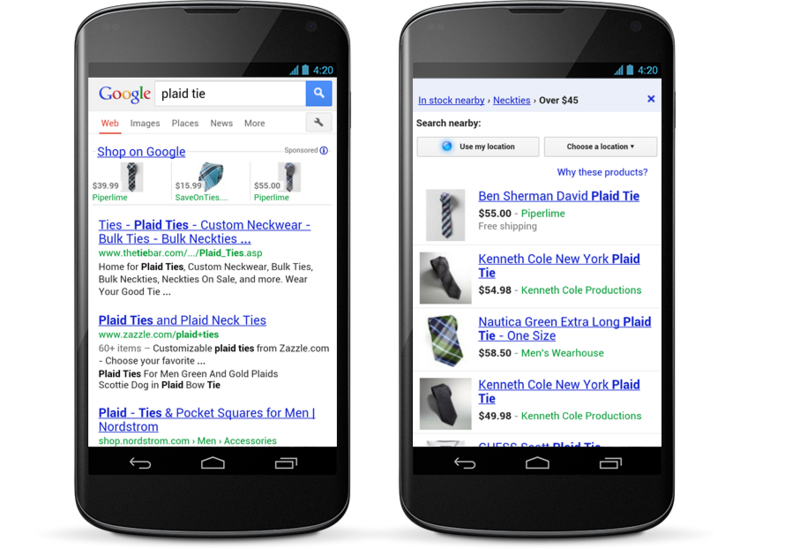 In the image on the left, a user searching for a plaid tie may see an ad unit displaying three options. He can click any of them to learn more and buy, or click ‘Shop on Google’ to continue browsing on Google Shopping, as shown in the image on the right. From there, the user can look at an even wider variety of options from different retailers. He can review and compare images, prices, reviews, shipping options and other information. Perhaps he’ll narrow his search down to plaid ties over $45, or filter to see just the selections available nearby. Finally, once the user has honed in on the perfect choice, he can easily complete his purchase on the retailer’s site. If you’ve already upgraded your Product Listing Ads to enhanced campaigns and made appropriate bid adjustments, your products will automatically be eligible to display in the new unit for smartphones. If you haven’t yet upgraded your Product Listing Ads to enhanced campaigns, we recommend you upgrade to increase coverage of your products and easily manage bids across devices, locations, and time of day - all from a single campaign. During this webinar, attendees will learn about how Google Shopping and Product Listing Ads work in concert with features that are part of enhanced campaigns. We will also discuss the latest Google Shopping user experience on smartphones and cover new multi-screen opportunities for retail advertisers. People today are constantly connected, presenting a tremendous opportunity for retailers to deliver the right products to them across devices anytime, anywhere. We recently announced the release of enhanced campaigns to help advertisers reach customers in a multi-screen world. Today we’re pleased to announce that Product Listing Ads are now eligible to appear on smartphones globally, extending the shopping experience already available on desktops and tablets. When a user enters a shopping-related search, a commercial format that displays products in a single unit may appear above organic search results. This ad unit is labeled as ‘Sponsored’ and displays rich product images, prices, retailers and more. This mobile shopping experience will be available in all markets currently serving Product Listing Ads.